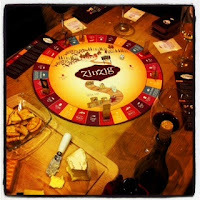 Wednesday night my neighbors and I gathered together for an evening of amazing wine, gourmet cheese, and a game of ZinZig. 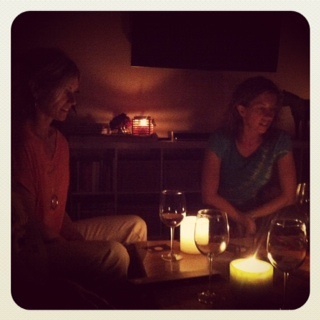 I have one fabulous group of girlfriends who are ready to rally at a moment's notice, even at 8:00 PM on a school night. We made ourselves comfortable in the living room and moments into playing the game, the power went out in our entire area, making our mountainous neighborhood crazy dark. But that wasn't going to deter 6 wine fanatics from completing a competitive game of wine trivia. I busted out every candle I could find because the show must go on. At 1:30 in the morning we finally called it quits, no closer to finishing the game than when we started. I have two theories to this. The first is that ZinZig is designed to be enjoyed, just like a good glass of wine is. It's not about winning in two minutes, or even two hours. It's about learning, savoring, and enjoying. My second theory is that the trivia questions are so interesting that they sparked all sorts of digressions. By the time we finally refocused on the task at hand, we had killed another bottle of wine and covered the most random topics imaginable, even for neighbor besties. All said, the game is cleverly designed and very entertaining. It can be played safely with the lights on or dangerously by candlelight. Just be sure to stock up on your favorite vino and prepare snacks that will sustain your friends possibly till daylight. Or until the power comes back on. Whichever happens first. Buy your own ZinZig game here!